The first term of Parliament (26 January to 24 March 2016) will see the first major event of the year, the State of the Nation Address (SONA) delivered by President Zuma on 11 February 2016. The President will deliver the speech to a special joint sitting of the National Assembly and the National Council of Provinces (NCOP). The lead up to the event will be closely watched following threats to disrupt the proceedings and a possible repeat of the 2015 events where the EFF was forcibly removed, the DA walked out and the cellular network signal was jammed to prevent real time reporting during the SONA. 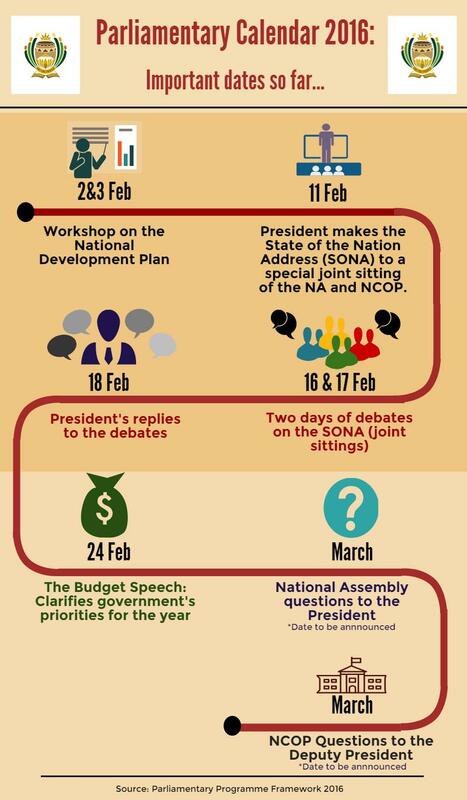 The debates on the SONA will be held on 16 and 17 February 2016 and the President will reply to the debate on 18 February 2016. On 24 February the newly appointed Minister of Finance, Pravin Gordhan will deliver the 2016 Budget Speech. This year, in addition to the focus on South Africa’s growth forecast and inflation rate, the Minister will probably focus on much publicised issues such as education, the unemployment rate and how to plug the budget shortfall. Other highlights include the tabling of departmental strategic plans throughout the first term, the President’s question session before the National Assembly and that of the Deputy President before the NCOP. The DA is also putting pressure on Parliament to schedule a motion of no confidence debate against the President during this term.